Kurdish officials have denounced Turkey’s incursion into Syria which observers said was aimed more at keeping Kurdish forces at bay than driving Islamic State of Iraq and Levant (ISIL) out of border areas. Turkey sent more tanks into Syria on Aug. 25, one day after launching an operation against ISIL in the Syrian town of Jarablus. The YPG has been a highly-effective force fighting ISIL in Syria. 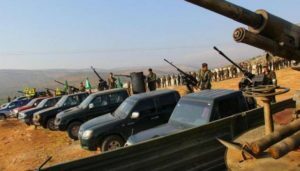 The so-called “Euphrates Shield” operation was also aimed at blocking the advance of the U.S.-backed Kurdish People’s Protection Units (YPG) militia that Turkey considers a threat equal to ISIL. “[The] Turkish state cannot shape our position there in accordance with its own interests. Our forces will remain there and there will be no retreat,” Xelil said, according to Kurdish media outlet Firat News. The YPG, the main component the U.S.-backed Syrian Democratic Forces (SDF), an alliance of Arab and Kurdish rebels who have had the most success in gains made against ISIL, bristled at Biden’s scolding. “We are in our own land and we will not leave it as per some request,” Xelil said. Erdogan’s government has long feared that if Kurds succeed in their quest for autonomy in northern Syria it will further ignite Kurdish separatist demands in Turkey. That is a major reason why, observers say, Turkey sent its forces into Syria. After the SDF drove ISIL out of the Syrian city of Manbij, the alliance set its sights on Jarablus, which is situated 20 miles to the north. Capturing Jarablus would have brought the Kurds’ goal of a contiguous stretch of land along the Turkish border — an area they hope would constitute an autonomous region — closer to reality. The move toward Jarablus appeared to be a step too far for Turkey. In an effort to block the Kurds’ advance, Turkey backed a mainstream Syrian rebel group that opposes Syrian President Bashar al-Assad — and that clashes frequently with the YPG — to take over Jarablus. “The U.S. had pledged to take Turkish security concerns into account regarding the YPG presence west of the Euphrates and has stuck to its commitment. I think this operation is the next logical move following the successful Manbij operation,” Stein told PRI. Stein said that the U.S. faces a difficult task in balancing Turkey’s fears over Kurdish aspirations, particularly as the YPG is a vital partner in the fight against ISIL. Should Turkish tanks wind up sharing a front line with Kurdish fighters, it raises the possibility of a violent flare-up between the two, he added.